Reblog (complete) from Chelsea Vowel, who is definitely singing my song! Yes please: let’s figure out how to gather together and make a difference! Though it hasn’t been much apparent in the past year, this blog started as a Cree language blog, and I’m going to take us back into that today to discuss Cree language revitalisation. First, if you haven’t checked it out yet, I have compiled many resources to help people access Cree language materials. There are what I call “Language and Culture Links” specific to Plains Cree. There are curricular resources for Plains Cree as well. 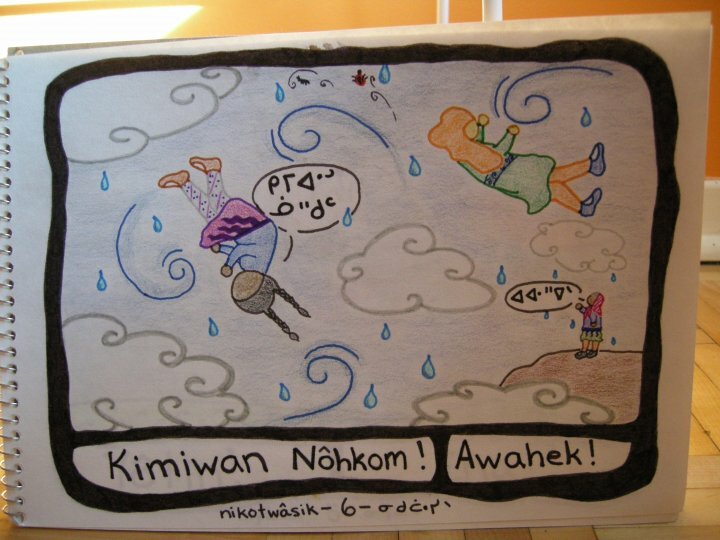 I started a page listing links to other Cree dialect resources, and I didn’t forget Michif! I put up links to resources in other indigenous languages, and listed some publishers who focus on indigenous literature. There is quite a bit out there, and I haven’t updated these resources in a while so there is likely even more now! However, when it comes to teaching my own children Cree, there are still not enough resources for me to access. I have had some ideas for a long time about what I’d like to see, and I’ve even at times tried (and failed) to get some sort of funding to get these projects going. This is no time to hang onto things, however. This is a time to share ideas and collaborate and get things happening NOW. With this in mind, I wanted to share some of my ideas and dreams in the hopes that there will be people out there with the kinds of skills I’m lacking to help these projects become real, ASAP. My eldest daughter is already 10, and I wanted her to be fluent by now. Time is ticking away, and if I’m going to help my children become Cree speakers, I’ve got to do absolutely all I can right now. I am sure that many of you out there feel the same pressure. Many of us live far from our home territories, in cities, or even provinces away from where we can actually hear our languages spoken. It is not enough to have a few books written in Cree, unless you yourself are fluent in the language and can model the pronunciation. Having resources which include audio are absolutely vital, in my opinion. I had a lot of different ideas about how to do this. Most of these ideas have become obsolete and so now I turn my thoughts to the app craze. Although there are issues with access to the technology needed to run apps, whether you’re doing it on a computer, an iPad or an android device, it is nonetheless a heck of a lot cheaper to develop an app than it is to full on publish other kinds of materials. After the base technology cost, these materials are also much cheaper for the purchaser. I want to create a series of leveled reader books with embedded audio that would be available in app format, and also easily translatable to other indigenous languages. I also want print materials available at low cost to teachers and parents, in case they don’t have access to the apps, or if they wish to foster literacy via high interest print books at low cost. Personally, I have a strong fondness for print books and even if I had the awesomest apps in the world, I’d want the books too. Thus the idea is to have resources available in print form, and in downloadable app form. To get a sense of how this would work, take a gander at the Reading A-Z site. This site offers high interest leveled readers for a moderate yearly fee. The books are short, have great graphics, and are appropriately leveled depending on the reader’s abilities. Multilevel books also allow you to use these materials with readers who are at different levels from one another. For classrooms, the books are made available in projector format. What I like best about these books, is that each of them comes with various activities linked to the reading, including comprehension quizzes. As a teacher, these comprehension quizzes are an awesome way of tracking progress in specific areas, and identifying skills that students are stronger or weaker in. Essentially what you do, is print the books off and then staple them into a booklet. Many people use coloured duct tape to code the books according to level and keep the staples from catching on little hands. In this way, a tonne of great resources are made available at an affordable price, and easily reusable in your classroom or home later. An associated site, Raz Kids, has most of these books online with audio, so that is possible as well. Of course, Raz Kids provides these as apps too. These kinds of materials could be put together fairly quickly and easily, and I’d like to start doing exactly that. What I am lacking, however, are artists and photographers. I’m putting the call out now, with this post, because I think this is something we can’t keep dreaming about. It needs to start happening, well…yesterday. When putting together materials for my own classroom, with zero budget for text books, I stumbled upon an absolutely fantastic mathematics program available free of cost. It is called the Mathematics Enhancement Programme and was put together by the Centre for Innovation in Mathematics Teaching(CIMT) in the UK. I mainly use the materials available for years 10 and 11, though sometimes I go higher and sometimes I go lower, depending on my student’s grade level. So in year 10, there are 19 chapters or units, with an optional unit on statistics. Since both pupil text books, exercise books AND teacher resources (lesson plans, teaching notes, overheads and so on) are provided, it is easy enough to see whether a particular unit matches your local curriculum. The program itself is excellent. It is clear, well laid out, and has been a smashing success in my classroom. I am able to teach at up to five different grade levels at the same time by grouping units thematically, and providing appropriate materials according to skill level. I can do both remediation and extension when needed. Now, I bring all this up because I noticed they had translated some of the primary materials intoSpanish for use in Chile. “Hey, why not have these materials in Cree?” I asked myself, and then contacted the CIMT and asked if this would be possible. Short version is that yes, it would be absolutely possible to work on translating these materials, on the condition that they remain free of charge. Music to my ears! I think that sometimes, when we develop materials in indigenous languages, we often give our linguists and speakers the herculean task of creating the language materials themselves, and also great resources in other subjects, in that language. So we have experts in language, being asked to create materials for math, social studies, and so on. Now this math program may need some tweaking in places to ensure it reflects indigenous worldviews, but on the whole, it is a very well put together program, for free, that can be translated RIGHT NOW into our language and used with our kids in the classroom or at home. This is a project I wish to begin ASAP as well, and I would love to collaborate with others on it so that the work goes more quickly. The nice thing here is that we would not have to worry about the technical aspects of inputting the translated text and so forth, so on the whole, this is the easier project than the one that requires us to create leveled readers. Wow! Sounds cool! Can’t wait until you get it done! My kids love it, but it’s amateurish. I would love to devote all of my waking hours to these projects, but I just can’t do it alone. If I could, it would all be done by now. I tried writing a kid’s book years ago, but I am not a graphic artist and so the results are cute, but not great. Plus, I did this before I decided I was going to stick with the standardised RSO, and I’m unhappy with the capital letters and apostrophes and so on. Point being, if this is ever going to happen, I’m going to need help from people who can add their talents and skills into the pot so we can bust out the best and tastiest Cree language revitalisation stew EVAH! My hope is that by spreading some of the work around, we can avoid burning out once we get the traditional ‘count to 10′ and ‘name the body parts’ materials done. I really want to take this further than is often the case when people try to create materials. I also want to make these materials as accessible and low cost as possible. To me, this is not about making money, this is about resurgence. So please, share your thoughts, assess your own talents, think about your needs and wants, and ask yourself and others if these kinds of things are something they want to get involved in. This entry was posted in From the Mainstream and tagged Chelsea Vowel. Bookmark the permalink.